Fujichrome Sensia 100, OM-2S, 21mm lens, B-setting at f/3.5, 1 GE Mazda 75 flashbulb, 2 Press 22 flashbulbs, tripod. "Here a single explorer detonates a GE Mazda 75 flashbulb. 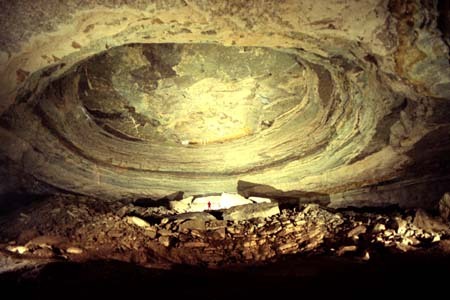 The immensity of this chamber can be appreciated by noting the small size of the cavers silhouette."